Starling Javier Marte (pronounced "MAR-tay")... Wife's name is Noelia...Has three children; sons Starling Jr. (10/5/09) and Smerling (9/20/13) and daughter Tiana (5/16/16)...Was ranked by Baseball America as Pittsburgh's fourth-best prospect and rated as the "Best Athlete" in the system prior to 2011 and 2012...Also recognized by the same publication as having the "Best Outfield Arm" in the farm system in 2011-12 and as the "Best Hitter for Average" prior to the 2012 season...Signed by Pirate scouts Rene Gayo and Chino Valdez. Set career highs in home runs, extra-base hits (57) and walks...Tied career high with 257 total bases (also 2015)...Was voted Team MVP by the local chapter of the BBWAA...Ranked third in the National League in stolen bases; was 33-for-47 in SB attempts...Became the third player in team history to produce at least 20 homers and 30 steals in the same season, joining Barry Bonds (1987, 1990-92) and Andy Van Slyke (1987-88)...His 17-game hitting streak between 7/4-24 was the longest of his career and matched Charlie Blackmon and Daniel Murphy for the longest in the N.L. in 2018...Ranked sixth among the N.L. leaders with a .330 batting average with runners in scoring position; his .396 average with RISP since 7/11 was the second-best mark in the league behind Mike Moustakas (.429)...Ranked fourth in the National League with a .404 average with runners in scoring position and two outs... Had the second-most assists (11) from center field...Was the Opening Day starter in center field for the second straight year; was the O.D. starter in left field the previous four seasons (2013-16)...Delivered his seventh career walk-off hit on 4/27 vs. St. Louis; an RBI-single with two outs in the 11th inning...Hit his first career inside-the-park home run on 5/4 at Milwaukee...Homered again the following day off Josh Hader...Suffered a right oblique strain in his first at bat on 5/15 vs. Chicago (AL) and was placed on the 10-day D.L. on 5/18 (retro to 5/16)...Was reinstated from the D.L. on 5/26 and hit a 447' home run to center field in his first at bat that night off St. Louis' Jack Flaherty...Recorded his 800th career hit and 300th career RBI on 6/21 vs. Arizona...Moved from the third spot to the second spot of the lineup on 7/4 and went 2-for-4 with two RBI at Los Angeles (NL)...Hit .281 (64-for-228) with 10 homers and 32 RBI in 58 games from the second spot and .264 (64-for-242) with nine homers and 34 RBI in 61 games from the third spot...Tied career high (second time) with three stolen bases on 7/6 vs. Philadelphia...Hit safely in 17 straight games between 7/4- 24, going 28-for-71 (.394) with seven homers and 20 RBI while raising his season average from .265 to .292...Homered in both games of the doubleheader on 7/14 vs. Milwaukee... Connected off Jackson Stephens for second career grand slam on 7/20 at Cincinnati...Was hit by a Trevor Bauer pitch in the left hand in his first at bat on 7/25 at Cleveland and was removed from the game; missed the next two games... Hit .341 (29-for-85) with seven homers and 20 RBI in 23 games in July...Homered once during the month of August (8/7 at Colorado)...Walked six times in a four-game span (19 plate appearances) between 9/25-28 after walking a total of six times in his previous 249 plate appearances...Received two walks in back-to-back games for the first time in his big league career on 9/27 and 9/28. Went 3-for-12 with a solo homer in three games with the Dominican Republic during the World Baseball Classic in March...Went 3-for-4 and homered off Andrew Miller in a firstround game against Team USA on 3/11 (D.R. won 7-5)...Was the Opening Day starter in center field - his 600th career game...Tied career high (10th time) with four hits on 4/9 vs. Atlanta; also hit his fourth career walkoff home run on 4/9...Stole home as part of a double steal on 4/11 vs. Cincinnati...Received an 80-game suspension, beginning 4/18, after testing positive for Nandrolone, a performance-enhancing substance, in violation of Major League Baseball's Joint Drug Prevention and Treatment Program...Joined the Pirates Extended Spring Training program in Bradenton on 5/2... Began rehab assignment with High-A Bradenton on 7/2; played the first five innings in left field and went 0-for-3 at the plate...Had rehab assignment transferred to Triple-A Indianapolis on 7/4...Went 5-for-18 (.278) in five games between 7/4-9; hit a three-run homer on 7/5 at Columbus...Had rehab assignment transferred to Bradenton on 7/10 during Triple-A All-Star break... Had two games rained out on 7/10 and 7/11; went 1-for-4 with a stolen base with the Marauders on 7/12 before being transferred back to Indianapolis on 7/13...Was recalled from rehab assignment on 7/17 and was reinstated from the MLB Restricted List on 7/18 ( the Pirates went 39-41 in the 80 games he missed)...Returned to his left field position after suspension...Tied career high (second time) with four runs scored on 7/21 at Colorado...Homered on 8/19 vs. St. Louis - his first long ball since 4/15...Had six straight multi-hit games between 8/15-20 (13-for-25, .520)...Hit .282 (72- for-255) with six doubles, two triples, five home runs, 24 RBI and 19 stolen bases after returning from his suspension on 7/18...His 19 stolen bases since 7/18 ranked third in the National League behind Dee Gordon (28) and Billy Hamilton (20)...Finished season hitting safely in 12 straight games (20-for-46, .435); the longest streak by a Pirates player in 2017 and one game shy of his career high (2014)...Made 56 starts in left field and 19 in center field; had eight assists (six from left field and two from center field). Was named to the National League All-Star team for the first time in his career (replaced the injured Yoenis Cespedes); singled off Andrew Miller as a pinch hitter in the ASG...Won his second straight Rawlings Gold Glove award - the first Pittsburgh player to capture back-to-back awards since outfielders Barry Bonds and Andy Van Slyke in 1991-92...Became the first Pirates player to have at least 40 steals and 30 doubles in a season since Barry Bonds (52 and 32) in 1990...Established career highs in batting, doubles, stolen bases, slugging and OPS (.818)...Ranked third among N.L. 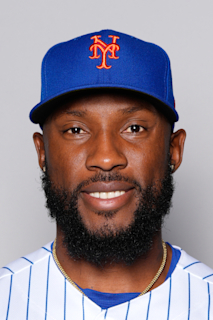 players in stolen bases...Finished sixth in the National League batting race; his .319 road average ranked ninth and his .323 average in day games was the sixth-highest in the circuit... Also ranked sixth among N.L. batters with a .355 average during interleague play...Led National League with 17 outfield assists; the most by a Pittsburgh player since Dave Parker had 26 in 1977...Became the first Pittsburgh player to steal 30 or more bases in four straight seasons since Barry Bonds (1989-1992)...Made his fourth straight Opening Day start in left field - the first Pittsburgh player to make four straight O.D. starts in left field since Jason Bay (2005-2008)... Connected off J.J. Hoover for first career grand slam on 4/8 at Cincinnati...Hit .323 in April, .326 in May and .345 in June... Was ejected from the game on 5/11 at Cincinnati for his disagreement in a caught stealing call at second base...Was on the Paternity List from 5/16-18 while his wife gave birth to daughter Tiana on 5/16...Was reinstated from the Paternity List on 5/19...Was hitting .331 after going 3-for-4 on 6/29 at Seattle...Picked up his 30th stolen base on 7/10 vs. Chicago; became the fourth Pittsburgh player to steal 30 or moe bases prior to the All-Star break (also Frank Taveras, Omar Moreno and Tony Womack)... Hit a game-winning home run in the 18th inning on 7/17 at Washington - just the fourth player in Pirates history to hit a home run in the 18th inning or later, joining Art Wilson (1916 at Wrigley Field), Jeff King (1989 against the Cubs in Pittsburgh) and Pedro Alvarez (2012 at St. Louis); Alvarez's homer came in the 19th inning, the others in the 18th...Doubled off Milwaukee's Chase Anderson for 600th career hit on 7/20 at PNC Park...Recorded his 200th career extra-base hit on 8/6 in his 571st Major League game; among Pirates players to debut in the last 40 seasons (since 1977), only Barry Bonds (465 games), Andrew McCutchen (493) and Aramis Ramirez (564) totaled 200 extra-base hits in fewer games...Hit .412 (14-for-34) with six multi-hit games over an eight-game stretch from 8/28-9/5...Missed 24 of the last 27 games (from 9/6 on) due to back discomfort... Started the game on 9/22 at Milwaukee, but left in the third inning (back)...Tied for fourth in the league with 16 HBP; has been hit by a pitch an MLB-leading 76 times since the start of 2013 season...Was selected to The Sporting News N.L. All-Star team following the season. Was one of four players in MLB with at least 10 home runs and 30 stolen bases (also A.J. Pollock, Jose Altuve and Charlie Blackmon); is the only player to do so in each of the last two seasons...Established career highs in home runs, RBI, doubles, games and runs scored...Led National League with 19 game-winning RBI, which were the most in one season by a Pittsburgh player since the stat was introduced by Major League Baseball in 1980...Ranked fifth in the N.L. in stolen bases...Captured his first Rawlings Gold Glove award and was named the Wilson Defensive Player-of-the-Year for left field...Made 141 appearances (133 starts) in left field and 18 appearances (10 starts) in center field...Led N.L. left fielders in fielding percentage (.995), making just one error in 196 total chances...Led National League outfielders with 16 assists, the most by a Pirates player since Jose Guillen had 16 in 1998... Ranked second among league leaders in being hit by pitch...Ranked ninth among N.L. batters with a .360 (27-for-75) average in Interleague play...Hit .327 (64-for-196) in 49 games while batting fourth in the lineup...Made his third straight Opening Day start in left field...His sac fly on 4/10 at Milwaukee was his first since 5/26/13 - also at Miller Park (224 games and 907 plate appearances between)...Homered in back-to-back games on 4/17-18 and had a career-high five RBI on 4/18 vs. Milwaukee...Hit four home runs in a five-game stretch between 4/17-21...Left the game on 4/22 vs. Chicago after being hit in the right hand by Jason Hammel (soft tissue contusion)... Delivered walkoff single in 13th inning to give Pirates 1-0 win on 6/12 vs. Philadelphia...Produced four straight games of at least three hits (13-for-21) from 6/12-15 - the first Pittsburgh player to do so since Willie Stargell, who went 14-for-17 over a four-game span in 1973 (September 7-10)...Had five straight multi-hit games between 6/12-16, raising season average from .251 to .286...Stole home as part of a double steal on 6/27 vs. Atlanta...Had sixth career four-hit game on 7/1 at Detroit while also hitting his 13th home, tying single-season career high...Left game on 7/5 with discomfort in left side and missed the next five games...Returned to action on 7/11...Hit .351 (27-for-77) in 20 games during the month of July...Connected off San Francisco's George Kontos for second career walkoff home run on 8/22...Went 13-for-20 during the four-game series in Colorado from 9/21-24; his 13 hits tied the club record for most hits in a four-game series, a feat first accomplished by Hall-ofFamer Pie Traynor against the Phillies in 1928 (August 2-4)...Hit a two-run walkoff homer off Cincinnati's Collin Balester in the 12th inning on 10/2...Hit .325 (37-for-114) in his final 30 regular season games, beginning on 9/2. 2015 POSTSEASON: Batted fourth and went 0-for-4 in Wild Card Game vs. Chicago on 10/7...Also had an outfield assist in the ninth inning. Established career highs in batting average, RBI, home runs, doubles and on-base percentage despite missing two weeks of action with a concussion in late July/early August...Was one of three players in MLB to hit at least 10 home runs and steal at least 30 bases (also Carlos Gomez and Jacoby Ellsbury)...Ranked second among National League players with a .348 (65-for-187) average and fourth with a .975 OPS after the All-Star break (minimum: 200 PA's)...Batted .336 (112-for-333) in 89 night games...Led club in stolen bases and tied for sixth among N.L. leaders in that department...Also tied for third among league leaders in being hit by pitch (17)...Made 114 appearances (107 starts) in left field and 28 appearances (16 starts) in center field...Was one of the three finalists for a Rawlings Gold Glove Award for left fielders...Made his second straight Opening Day start in left field...Was successful in 12 straight stolen base attempts from 4/8 to 5/17...Hit seventh in the starting lineup for the first time in his career on 5/1 and went 2-for-3 with a walk and two stolen bases...Hit first career walkoff home run on 5/2; a solo shot off Toronto's Sergio Santos to break a 5-5 tie in the ninth inning; went 4-for-5 in the game while batting sixth in the order...Left game on 5/10 vs. St. Louis with tightness in his back...Had two-run double as a pinch hitter on 5/14 at Milwaukee...Reached base safely in all four plate appearances on 5/17 at Yankee Stadium, which included his third home run...Homered again the following day in game two of a doubleheader at Yankee Stadium - also left the game with tightness in his left hamstring...Did not start four straight games between 6/3-7...Homered and tied career high with four hits (fourth career time and second in 2014) on 6/13 at Miami...Hit safely in 10 straight games from 6/9-19 (19-for-46, .413)...Missed two games (6/21-22) for personal reasons...Left game on 6/24 at Tampa Bay with concussion-like symptoms and a jammed right middle finger after colliding with second baseman on head-first slide on stolen base attempt in fifth inning...Was on the Bereavement List from 7/9-16...Was hit in the head by a 93 mph pitch thrown by Colorado's Adam Ottavino on 7/18...Walked as a pinch hitter on 7/20 and made start in left field on 7/21...Was placed on the 7-day concussion disabled list on 7/23...Was on a rehab assignment with Triple-A Indianapolis from 8/2-4...Recalled from rehab and reinstated from D.L. on 8/5...Batted cleanup in starting lineup for first time in his career on 8/16 at Washington and went 2-for-4 with a double and RBI...Homered twice (second career two-homer game) on 8/18 vs. Atlanta...Made 14 straight starts in center field from 8/5-19 while Andrew McCutchen was on the D.L. and hit .373 (19-for-51) with six doubles, three home runs and eight RBI...Fell a triple shy of hitting for the cycle on 9/8 at Philadelphia...Had five straight multi-hit games from 9/6-10 and a 10-game hitting streak from 8/31 thru 9/10 (16-for-42, .381)...Left the game on 9/11 at Philadelphia after being hit by a pitch on his left arm in his first at bat...Returned to action on 9/14 vs. Chicago (NL); played the final two innings in left field and went hitless in one at bat...Delivered the game-winning hit as the Pirates clinched a playoff berth on 9/23 at Atlanta just like he did on the same date in 2013 at Wrigley Field; the first Pirates player to record the game-winning RBI on the date that the Pirates clinched a postseason berth in two straight years since RBIs became an official statistic in 1920...Hit .363 (33-for-91) in September and finished season with a career-high 13-game hitting streak (18-for-53, .340)...Hit .354 (64-for-181) with 13 doubles, one triple, eight home runs and 22 RBI in 49 games after being reinstated from 7-day concussion D.L. on 8/5...Produced a .415 (27-for-65) average, four home runs and 11 RBI in 17 games while batting sixth in the lineup...Batted fifth and went 1-for-4 in Wild Card Game vs. San Francisco on 10/1. 2013 SEASON: Ranked third in the National League in stolen bases and tied for second in triples...Ranked second in HBP and was the sixth-toughest to double up in the league (once every 85 AB)...Led N.L. hitters wih a .402 (37-for-92) average against LHP...Also led the league in caught stealings...Ranked second among N.L. leadoff batters with 12 home runs and third with a .440 slugging percentage...Became the first Pittsburgh player since Jack Wilson in 2004 and the first Bucco outfielder since Andy Van Slyke in 1992 to collect at least 10 doubles, 10 triples and 10 home runs in the same season...Made 124 appearances (113 starts) in left field and 13 appearances (six starts) in center field...Was Pittsburgh's Opening Day starter in left field and went 0-for-3 with a walk...Posted five straight multi-hit games from 4/6-10...Had a 10-game hitting streak (19-for-43, .442) from 4/6-17...Tied a Major League record and a club mark (third time) with five strikeouts in a nine-inning game on 4/18 vs. Atlanta...Started and led off each of the first 15 games before sitting out on 4/19 vs. Atlanta...Snapped an 0-for-12 streak on 4/21...Hit safely in eight straight games from 4/21-28 (11-for-34, .324)... Went 3-for-5 with a three-run homer on 4/30 at Milwaukee and finished the month of April tied with Pablo Sandoval for the league lead in hits (35)...His 35 hits during the month of April were the most by a Pittsburgh player since Nate McLouth had 35 in 2008...Hit second career home run leading off the first inning on 5/5 vs. Washington...Went 8-for-24 (.333) with four home runs, eight RBI and three stolen bases during the week of 4/29-5/5...Scored a run in 10 straight games from 4/27 thru 5/8 (11 runs total)...Was scratched from his start on 5/27 due to migraine symptoms...Scored a career-high four runs and had a career-high four hits on 6/12 vs. San Francisco...Was scratched from the starting lineup on 6/14 due to discomfort in his left rib cage and missed three games...Tripled in back-to-back games on 6/18-19 and had three triples in a four-game span from 6/18-21...Had first career two-homer game while also tripling and scoring three runs on 6/25 at Seattle...Fell a home run shy of hitting for the cycle on 6/28 vs. Milwaukee...Went 22-for-60 (.367) with five doubles, two triples, three home runs and 13 runs scored during a career-high 12-game hitting streak from 6/23 thru 7/7...Snapped an 0-for-20 streak on 7/24 at Washington...Tied career high with four hits on 8/9 at Colorado...Recorded his 10th triple on 8/15 at St. Louis...Suffered a right hand contusion and a sprain to the ring finger on his right hand while being caught stealing third base on 8/18 vs. Arizona...Was placed on the 15-day D.L. on 8/24 (retro to 8/19)...Was reinstated from the D.L. on 9/7 and served as a pinch runner and late-inning defensive replacement for seven games before making start on 9/17 vs. San Diego...Homered off Kevin Gregg in the ninth inning at Wrigley Field on 9/23 to break a 1-1 tie and give the Pirates a 2-1 victory; the win clinched Pittsburgh's first postseason berth since 1992...Swiped a career-high three bases on 9/25 at Chicago...Went 6-for-19 (.316) with four stolen bases and four runs scored in his last five regular season games...Hit .429 (3-for-7) with one double in three games with Escogido during the Dominican Winter League. 2013 POSTSEASON: Went 3-for-24 (.125) in six games...Went 2-for-5 with a double in the Wild Card Game vs. Cincinnati on 10/1...Hit a solo home run off Shelby Miller in Game Two of the Division Series at St. Louis on 10/4...Went hitless in his last 12 at bats in the N.L.D.S. Began season with Triple-A Indianapolis, where he led the International League in triples...Set minor league career highs in RBI and triples...Was named to the league's mid- and post-season All-Star teams...Hit safely in each of his first nine games and in 17 of his first 20 (23-for-76, .303) thru 4/27...Had three hits and three stolen bases on 5/22 at Buffalo...Hit .325 (39-for-120) in 29 games during the month of June...Had a 15-game hitting streak from 6/25 thru 7/12, going 26-for-65 (.400) with three doubles, four triples, three home runs and 16 RBI...Had eight straight multi-hit games between 6/25 and 7/2 and was named the league's Player-of-the-Week after hitting .486 (18-for-37)...Had season-high five RBI on 6/28 vs. Toledo...Fell a single shy of hitting for the cycle on 7/16 vs. Gwinnett...Made 76 appearances in center field, 16 in left field and five in right field while playing with Indianapolis during the regular season...Hit safely in his last five Triple-A games (9-for-22, .409) before being recalled by Pittsburgh on 7/26...Made Major League debut that night as the starter in left field; was the leadoff batter and hit the first pitch thrown to him for a home run, becoming the third Pittsburgh player to homer in his first at bats (also Walter Mueller on 5/7/22 and Don Leppert on 6/18/61 - Mueller's also came on the first pitch)...Hit .290 (18-for-62) with four homers, 10 RBI and three stolen bases in his first 15 games thru 8/10...Went 6-for-33 (.182) in his next eight games before being placed on the 15-day disabled list on 8/19 with a right oblique strain...Made a rehab appearance with State College on 9/4 and also went 2-for-7 with a walk, RBI and four runs scored in two post season games with Indianapolis...Was reinstated from D.L. on 9/7 and hit .264 (19-for-72) in final 24 games with the Pirates...His home run on 10/1 vs. Atlanta was his first since 8/8...Made 43 appearances (38 starts) in left field and four appearances (one start) in center field with Pittsburgh; made lone start in CF on 7/29 at Houston...Had three errors and three assists...Hit .285 (41-for-144) with 16 RBI and 17 runs scored in 37 games (34 starts) from the leadoff spot...Hit .318 against LHP and .236 against RHP...Went 9-for-29 (.310) with runners in scoring position and 7-for-16 (.438) with runners in scoring position and two outs...Ranked third among National League rookies in stolen bases and second on the club in that department... Hit .304 (34-for-112) with four doubles, four triples, two home runs, 20 RBI and eight stolen bases in 29 games with Escogido during the Dominican Winter League...Was also named MVP of the Series Final as his club swept Aguilas, five games to none, to capture the championship. Spent entire season with Double-A Altoona and led Eastern League in batting, hits and doubles...Became the firstplayer in the club's 13-year history to capture the batting title...Was named to the league's mid- and post-season All-Star teams...Participated in the MLB All-Star Futures Game in Phoenix (started the game in center field, batted leadoff and went 1-for-3)...Was namedthe Eastern League Rookie-of-the-Year...Set a single-season club record with 178 hits, breaking Nate McLouth's previous record of 166 in2004...Led Altoona in runs scored and stolen bases, tying his career high in that department...Ranked second among Pittsburgh farmhandsin batting behind Bradenton's Ramon Cabrera (.343)...Made all 129 defensive appearances in center field and led league with 18 outfieldassists...Had hits in five straight at bats from 4/9-10 and produced a 13-game hitting streak from 4/9/25 (25-for-59, .424)...Had a careerhighsix RBI on 4/22 at Richmond...Hit .331 (39-for-118) in 29 games during the month of May...Hit safely in 11 straight games between6/17-28 (17-for-44, .386) and .337 overall in June...Hit .265 in July, but rebounded to hit .393 in August...Produced a 14-game hittingstreak from 7/23 to 8/6 (22-for-57, .386)...Was named Eastern League Player-of-the-Week for the week of 8/8-15 after going 15-for-27(.556) with 10 runs scored and five multi-hit games in six games...Put togther a season-best, 16-game hitting streak from 8/19 to 9/3(28-for-71, .394)...Was named Eastern League Player-of-the-Month for August...Hit .328 (40-for-122) with seven doubles, two home runs,14 RBI and nine stolen bases in 30 games with Leones del Escogido during the Dominican Winter League. Began season with High-A Bradenton and hit safely in 17 of his first 21 games thru 5/5, going 25-for-74 (.338) with a .432 onbasepercentage, 11 RBI and 15 runs scored...Scored a career-high four runs in his first game on 4/8 vs. Fort Myers...Was placed on thedisabled list on 5/15 and had surgery to repair a broken bone in his left hand...Went 9-for-26 (.346) in an eight-game rehab assignmentwith the GCL Pirates from 7/3-31...Was reinstated from D.L. on 8/1 and batted .358 (39-for-109) with 19 RBI in 29 games during themonth of August...Ranked third among Pittsburgh farmhands with 26 stolen bases...Made a total of 57 appearances in center field and twoin right field; made his two appearances in right field with Bradenton on 4/13 and 4/14...Hit .213 (13-for-61) with a homer and three RBIin 28 games with Aguilas during the Dominican Winter League. Hit .309 (71-for-238) with three home runs, 35 RBI and 24 stolen bases in 57 minor league games...Began season with theGCL Pirates and went 0-for-7 in two games before being promoted to West Virginia on 6/25...Hit safely in each of his first 10 games withthe Power (15-for-40, .375) and in 32 of his first 33 games thru 8/9...Recorded a 22-game hitting streak from 7/9 thru 8/9, going 30-for-94 (.319) with 17 RBI, 16 runs scored and 11 stolen bases...Hit safely in 48 of his 54 starts with West Virginia...Was promoted to High-ALynchburg and played in one game on 9/5; suffered a sprained ankle which prevented him from participating in the post season with theCarolina League champions...Made a total of 38 appearances in center field and 20 in right field with the three clubs...Went 3-for-13 (.231)in 11 games with Aguilas during the Dominican Winter League. Spent second straight season with the DSL Pirates...Led team in home runs and ranked fourth in the league in that department...Also ranked fourth in the league in runs scored...Led DSL Pirates in stolen bases and ranked second in RBI...Made 40 appearances incenter field, 21 in right field and seven in left field...Hit five of his nine home runs during the month of July...Batted .377 (29-for-77) in hisfinal 20 games, beginning with three straight three-hit games from 7/30-8/2...Went 4-for-4 on 8/19. Began professional career with the Dominican Summer League Pirates at the age of 18...Made 35 appearances in left field, threein right field and one in center field...Also went 4-for-14 in four games as the designated hitter...Hit lone home run on 6/23 against the DSLWhite Sox...Batted .288 (17-for-59) in his first 17 games thru 6/30; .164 (12-for-73) in his last 28. April 20, 2019 Pittsburgh Pirates placed CF Starling Marte on the 10-day injured list. Abdominal wall contusion. May 26, 2018 Pittsburgh Pirates activated CF Starling Marte from the 10-day injured list. May 18, 2018 Pittsburgh Pirates placed CF Starling Marte on the 10-day disabled list retroactive to May 16, 2018. Right oblique strain. July 18, 2017 Pittsburgh Pirates activated CF Starling Marte from the restricted list. July 13, 2017 sent OF Starling Marte on a rehab assignment to Indianapolis Indians. July 10, 2017 sent LF Starling Marte on a rehab assignment to Bradenton Marauders. July 4, 2017 sent OF Starling Marte on a rehab assignment to Indianapolis Indians. July 2, 2017 sent OF Starling Marte on a rehab assignment to Bradenton Marauders. April 18, 2017 Pittsburgh Pirates placed CF Starling Marte on the restricted list. October 3, 2016 Pittsburgh Pirates activated LF Starling Marte from the 15-day disabled list. October 1, 2016 Pittsburgh Pirates placed LF Starling Marte on the 15-day disabled list retroactive to September 28, 2016. Back tightness. May 19, 2016 Pittsburgh Pirates activated LF Starling Marte from the paternity list. May 16, 2016 Pittsburgh Pirates placed LF Starling Marte on the paternity list. August 5, 2014 Pittsburgh Pirates activated LF Starling Marte from the 7-day disabled list. August 2, 2014 Pittsburgh Pirates sent OF Starling Marte on a rehab assignment to Indianapolis Indians. July 17, 2014 Pittsburgh Pirates activated LF Starling Marte from the bereavement list. July 9, 2014 Pittsburgh Pirates placed LF Starling Marte on the bereavement list. December 18, 2013 OF Starling Marte assigned to Leones del Escogido. September 7, 2013 Pittsburgh Pirates activated LF Starling Marte from the 15-day disabled list. August 24, 2013 Pittsburgh Pirates placed LF Starling Marte on the 15-day disabled list retroactive to August 19, 2013. Right hand sprain and contusion. September 7, 2012 Pittsburgh Pirates activated LF Starling Marte from the 15-day disabled list. September 5, 2012 State College Spikes sent OF Starling Marte on a rehab assignment to Indianapolis Indians. September 4, 2012 OF Starling Marte assigned to State College Spikes. August 19, 2012 Pittsburgh Pirates placed LF Starling Marte on the 15-day disabled list. Strained right oblique. July 26, 2012 Pittsburgh Pirates recalled Starling Marte from Indianapolis Indians. March 18, 2012 Pittsburgh Pirates optioned Starling Marte to Indianapolis Indians. November 18, 2011 Pittsburgh Pirates selected the contract of Starling Marte from Altoona Curve. October 14, 2011 CF Starling Marte assigned to Leones del Escogido. April 2, 2011 Starling Marte assigned to Altoona Curve from Bradenton Marauders. March 2, 2011 CF Starling Marte assigned to Pittsburgh Pirates. August 1, 2010 Starling Marte roster status changed by Bradenton Marauders. July 3, 2010 sent OF Starling Marte on a rehab assignment to GCL Pirates. May 16, 2010 Bradenton Marauders placed OF Starling Marte on the 7-day disabled list. Left hand injury. March 20, 2010 CF Starling Marte assigned to Pittsburgh Pirates. October 16, 2009 CF Starling Marte assigned to Aguilas Cibaenas. September 21, 2009 Lynchburg Hillcats activated CF Starling Marte from the 7-day disabled list. September 9, 2009 Lynchburg Hillcats placed CF Starling Marte on the 7-day disabled list retroactive to September 7, 2009. September 5, 2009 CF Starling Marte assigned to Lynchburg Hillcats from West Virginia Power. June 25, 2009 Starling Marte assigned to West Virginia Power from GCL Pirates. June 23, 2009 GCL Pirates signed free agent Starling Marte. May 20, 2009 CF Starling Marte elected free agency.